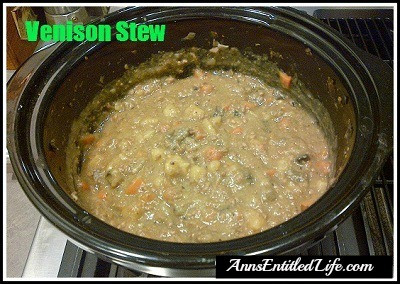 This is Hubby’s venison stew recipe. Hubby likes a soup-like texture hence the ground meat and diced vegetables. This recipe originally appeared on Coupons, Deals and More. I have recovered a great many of the best loved recipes, and will be posting them on Ann’s Entitled Life twice a week until the are all up! If you had a favorite recipe you would like to see posted sooner rather than later, please email me your request, and if I have it, I will post it! And as always, your recipe help is appreciated. If you have a great, easy recipe made with many ingredients commonly found in the pantry, please email me the recipe and a photo via this email address. Thank you!